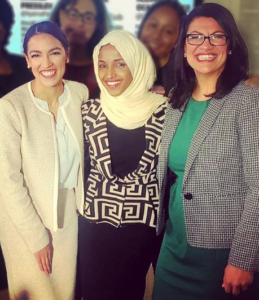 Home > News / Press Release > ZOA: Why Are Democrats Not Condemning Anti-Israel Reps. Tlaib, Omar & Ocasio-Cortez? The Zionist Organization of America (ZOA) is questioning why Congressional Democrat leaders and other Democrats have said and done nothing to condemn, marginalize and ostracize Reps. Rashida Tlaib (D-MI), Ihlan Omar (D–MN) and Alexandria Ocasio-Cortez (D-NY), on account of Tlaib and Omar’s extremist and hateful anti-Semitic, anti-Israel remarks and acts, and Ocasio-Cortez’s hostility to, and false statements about, Israel and refusal to condemn BDS or endorse a political solution that encompasses Israel’s continued existence. Their deafening silence is allowing anti-Semitism to be dangerously mainstreamed and legitimized. ZOA calls on the Democratic Party to condemn the recent ugly and vicious attacks on Israel by Democrat Reps. Tlaib, Omar and Ocasio-Cortez. Rep. Tlaib, calls Israel a “racist country” on the basis of the lie that Israel discriminates against those “darker skinned,” supports the destruction of Israel in favor of an Arab-dominated state (“It has to be one state”), “absolutely” backs withholding US aid from Israel, and openly supports the Boycott, Divestment, and Sanctions (BDS) movement, which is committed to international ostracism and weakening of Israel with a view to its eventual elimination. On her first day in office earlier this month, Rep. Tlaib placed a so-called correction to the world map in her Congressional office, which has a post-it with the word ‘Palestine’ placed with an arrow pointing at Israel, thereby indicating her support for the Palestinian Arab objective of eliminating and replacing the Jewish state of Israel. Only this week, Rep. Tlaib met with a fellow extremist seeking Israel’s destruction, Abbas Hamideh, founder of Al-Awda – The Palestine Right of Return Coalition, who also openly calls for Israel’s destruction, calls the Jewish state “the illegal terrorist entity of Israel,” routinely refers to “Criminal Zionism” and attacks Muslim moderates like Shia Imam Mohammad Tawhidi. She also embraced Israel-hater and Farrakhan-lover and Jew-killer-praiser Linda Sarsour at Tlaib’s induction ceremony. Also this week, it emerged that Rep. Tlaib failed to disclose that it was the George Soros group who in 2017 paid her $85,307, contrary to the rules of the House Ethics Committee, which requires all candidates to disclose the names of groups and organizations that provide their sources of income. (Hungarian-born Jewish billionaire speculator George Soros is a veteran anti-Zionist and anti-American advocate who ploughs billions of dollars into organizations designed to undermine both countries and started his career in Nazi-occupied Hungary disguised as a Christian teenager, helping a government official to despoil Jews of their possessions prior to their deportation to death camps; by his own admission, with no qualms of conscience). Rep. Ocasio-Cortez, a member of the Democratic Socialists of America (who support BDS), falsely and maliciously condemned Israel last July for committing a “massacre” against Gaza “protesters” when in fact the Palestinian Arabs concerned were murderous rioters attempting to enter Israel to murder Jews. Indeed, Hamas, the European Union- and US-designated terrorist group that controls Gaza, had already admitted the previous May that many of its members were among those trying to breach the border fence and that 50 of the 61 who had then been killed were in fact Hamas members. 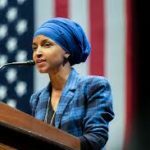 Ocasio-Cortez also criticized the growth of Jewish communities in Judea/Samaria (in fact, there haven’t been any new communities built there since 1993 and they comprise less than 2% of the entire West Bank), before admitting “I am not the expert on geopolitics on this issue … Middle Eastern politics is not exactly at my kitchen table every night.” Ocasio-Cortez also refused to condemn BDS or join other freshman Congress members in a visit to Israel and, after having first indicated support for establishing a Palestinian state alongside Israel, she backtracked, refusing to endorse a solution that theoretically leaves Israel intact. ZOA National President Morton A. Klein said, “It is extraordinary that Congressional Democrats have been virtually silent and done nothing to criticize, censure, dissociate themselves from or in some way distance themselves from Rasihda Tlaib and Ihlan Omar on account of their vicious anti-Semitic opposition to Israel’s existence and their extreme anti-Israel words and deeds, which have been plentiful. “Congressional Democrats have also never called out Alexandria Ocasio-Cortez for her false claims about Israel committing a massacre in Gaza or her backtracking on supporting Israel’s existence. “Why have Democrats never criticized and even elected Israel-hater, and Farrakhan acolyte, to be Deputy Director of the Democratic Party? Why have Democrats never criticized the Congressional Black Caucus for meeting with anti-Semite Louis Farrakhan? Why did they never criticize President Obama for taking smiling pictures with and affiliating with Farrakhan? Why did they not criticize President Clinton for sitting next to and smilingly shaking hands with Farrakhan at Aretha Franklin’s funeral? Why are Democrats seeking Israel-hater Al Sharpton’s endorsements? Why have Democrats not called out their new freshman Congressional colleagues who engage in vicious hostility towards Israel, a democratic state and close US ally? Are Democrats saying by their silence that they do not care about this issue, or that they do not view Israel as an ally? Why have they voted this week to stop anti-BDS legislation? Are they saying in effect that they will simply allow this racism and anti-Semitic hatred and actions and statements against Jews and the Jewish State to grow like a cancer? I’m very worried that their deafening silence is allowing anti-Semitism to be dangerously mainstreamed and legitimized. It’s frightening.